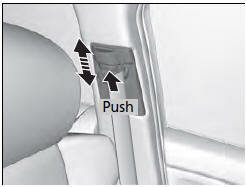 The front seats have adjustable shoulder anchors to accommodate taller and shorter occupants. 1. Move the anchor up and down while holding the release button. 2. Position the anchor so that the belt rests across the center of your chest and over your shoulder. The shoulder anchor height can be adjusted to four levels. If the belt contacts your neck, lower the height one level at a time. After an adjustment, make sure that the shoulder anchor position is secure.